By David Torres, a member of the Samaritan’s Purse disaster response team in the Philippines to help victims of Typhoon Haiyan. “Sorry sir, no space.” The Philippine officer had just advised us that we would not be on the 5 a.m. C-130 flight to Tacloban, despite assurances the previous afternoon and our own efforts that had begun at 1 that morning. Our hearts sank. As an advance team, we urgently needed to get there to prepare for our upcoming medical response arriving via a charted 747 in just a few days. Tacloban, one of the hardest hit cities in the Visaya Province, has devolved into anarchy with widespread looting and chaos. 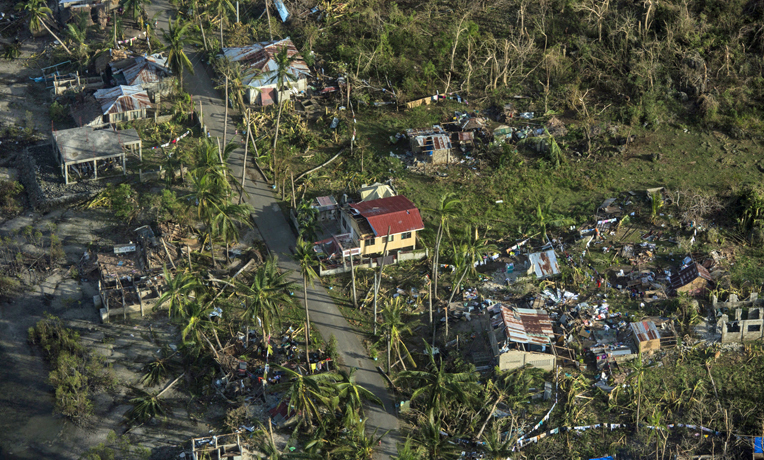 The whole community had been ripped apart at its seams by Typhoon Haiyan and now sits isolated and in ruins. Bodies lie strewn about in the streets. Civil society is shaken to its core as the population struggles to survive without food, shelter, or potable water. The only access to this island city is through military airlift, which has become a scarce resource for those needing access, including international agencies like Samaritans Purse. Our team members looked at each other as discouraged as everyone else who was bumped from the flight. The fog of the disaster was thick around us as we asked questions and looked for someone—anyone—who could put us on the manifest for the next available plane. We felt helpless, directionless as a leaf in high winds, unsure of anything or anyone we could rely upon. So we prayed. As Christians we know that God answers prayers. But as many of us have experienced, sometimes the answer is “no” or “wait.” So we rationalize in our mind that perhaps we’ve asked for something too difficult or unrealistic. But despite our anemic faith and rationalizations, God is faithful beyond our expectations. He was this morning. No more than 15 minutes had passed since the prayer left our lips when an officer came in with a new manifest. There on the list were our three names, but with one peculiar notation that none of the rest of the names had. We were “Code 1″ passengers. We had received Presidential priority! Yes, sometimes the answer is no or wait. But sometimes, God answers prayers with an eager exclamation point as he did this time. This morning, in the midst of discouragement and helplessness, we are witnesses to His faithfulness. “I am the Lord your God, who brought you up out of the land of Egypt. Open your mouth wide, and I will fill it” (Psalm 81:10, ESV). Samaritan’s Purse supports local ministry partners in the region as they provide physical help to suffering people in Jesus’ Name. They are currently bringing desperately needed relief and comfort to families affected by Super Typhoon Haiyan. So inspiratonal! Thanks for reblogging it!